India has actively supported Vietnam in training, capacity building, defence technology transfer,” Quang said. 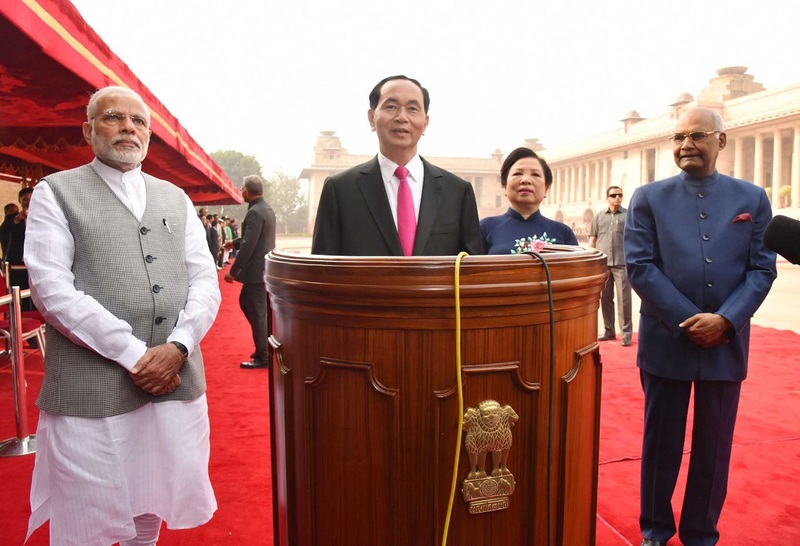 President of Vietnam, Tran Dai Quang extended invite to business communities in India to invest in Vietnam and said that his country offers conducive environment and sustainable development. “India continues to be among Vietnam’s top ten trading partners as the bilateral trade turnover has increased 16% per annum on average in the past decade,” the Vietnamese President said while addressing a business meeting jointly organised by ASSOCHAM, CII and FICCI in New Delhi on Saturday. “India has given priority to Vietnam in development cooperation and education and training, and paid attention to promoting bilateral cooperation in science and technology, information and communication, energy, oil and gas, agriculture and tourism,” he said. “India has actively supported Vietnam in training, capacity building, defence technology transfer, defence credit and technology,” he added. President Quang was on a three-day visit to India, arrived in New Delhi on Friday, at the invitation of his India’s President Ram Nath Kovind. “Both the nations are now strategic and developmental partners with growing multi-dimensional linkages and the trade figures between the two economies make this clearly evident,” said Bhamre. Vietnam is an important partner of India in Southeast Asia and is the fourth trading partner among the ASEAN. Apart from ASEAN, the two nations closely cooperate in other regional forums like the East Asia Summit, Asia Europe Meeting (ASEM), Mekong Ganga Cooperation, besides the WTO and UN. The bilateral trade between India and Vietnam has increased to $10.1 billion in 2016-17, from $7.8 billion in 2015-16. The two countries has set the target of $15 billion trade by 2020. Apart from this, the two countries have active cooperation in the peaceful purposes of outer space and atomic energy, cyber security and information technology, and science and technology. India is a vital development aid partner for Vietnam and has extended various lines of credit to the Southeast Asian nation for capacity building. During President Quang’s visit, India and Vietnam has signed three memorandums of understandings (MoUs), dealing with nuclear cooperation, agriculture and trade. India is among the few nations with which the trade deficit of the US has dropped.